RIO DE JANAIRO, Tuesday.- Sri Lanka’s ace shooter Mangala Samarakoon said that he feels like giving up the sport and announcing his retirement as the country’s shooting federation officials had failed to provide him a suitable shooting kit, even though the Sports Minister had released funds well in advance. It was an altered shooting bottom that had cost Samarakoon his men’s 10m air rifle event at the XXX1st Olympic Games here yesterday. Neither Samarakoon nor the Sri Lanka team management had been aware that the shooter’s four-year-old bottom was not up to international specifications. Hence, Samarakoon’s bottom had been rejected at the through testing of equipment and firing attire of competitors. The meet officials found that the thickness of the bottom’s hip is more than what is permitted. Since the shooter and his coach Pushpamali Ramanayake were helpless at that stage, they had no option but to cut and remove a strap part of the bottom (around its waist). That had caused severe problems to Samarakoon when taking the grip and holding the weapon on his hip. “Since a strip around the waist of the bottom had been removed, I could not hold the weapon against my waist (hip) when taking the grip. After each firing shot, I had to raise my bottom up and adjust it. I had to struggle against time as well as my losing concentration,” Samarakoon said. “I am not pointing finger at anyone or giving excuses after defeat. But I merely want to tell my side of the story as to why I have failed. I was totally helpless when firing with that altered bottom where as all fellow shooters were well geared with the most modern outfits,” he told the Daily News immediately after his qualification event in men’s 10m air rifle event. “There is no point in continuing the sport like this. I feel like giving up and retiring” a dejected Samarakoon said after finishing last in his pet event. He added that he had never come across with such a miserable total, even at the early stages of his career. Former Commonwealth Games gold medallist turned coach Pushpamali Ramanayake too endorsed Samarakoon’s views. “I have been coaching him for many years and never seen him firing such a low score. It was totally due to the negligence and irresponsible acts of the shooting federation officials. I feel pity for him because he has been training hard and putting on a lot of effort for the Olympics. 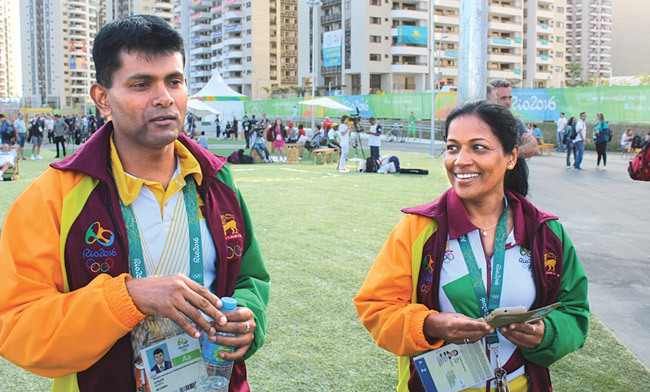 He is a better shooter than his score yesterday reflects,” a disappointed Ramanayake said. “I hardly could do much in my capacity. Although he had fired at the last South Asian Games with this kit, we were told by the technical officials here that it is not up to international specifications. Samarakoon has been an unfortunate victim of shooting officials’ irresponsible acts,” she said. Samarakoon, who also faced a shortage of ammunition for training here before the matter was sorted out at the eleventh hour, said he had brought the issue of his firing kit to the notice of the officials more than a year ago. “I must thank the Sports Minister for releasing funds to the shooting federation to buy me a new kit. But the shooting officials have been sitting on it. They first said I will get the new kit for the South Asian Games. But until my departure to Brazil, they failed to get that down,” Samarakoon added. “Unlike in the past, Sri Lanka’s national controlling body for shooting is now headed by a team of civilians who apparently find it difficult to perform the logistical part. When it was manned by the tri forces, the officers did a good job as they had ability, resources and power to tackle Ministry problems. Even they could not get the necessary clearance to take my weapons to Rio and it was finally the Army officials who helped us with the necessary Defence Ministry clearance,” Samarakoon explained.